My mother passed away the morning of March 1, 2009. Later that day, I had to choose the outfit that she would be buried in. I went back and forth between two of her nicer outfits. I ultimately chose the one that had a sweater with it because I didn’t want her to be cold. The practical side of me knew that the temperature was really no concern for her anymore. The irrational side of me never wanted to worry that she was cold. I looked for the pants that matched the sweater but I couldn’t find them. I remember looking over at her bed where just hours earlier I had listened to her take her last breath and wanting so desperately to ask her where the pants were. It was the first time that I had a question for her and I knew I would never know the answer. I felt an emptiness inside of me that would never be filled. As the days went on we cleaned out her house and divided up her belongings. I took with me a stuffed animal bear that I knew had a name. The problem was I couldn’t for the life of me remember what that name was. I looked at him over and over again questioning what she had called him. I came up with a name that I thought it might be. It sounded familiar. However, I knew that I could never call him a name that might not be his real name. Every time I said it I would question if my mother was shuddering in Heaven while her daughter called her beloved bear by the wrong name. I decided the next best thing to do was to give him a new name. I knew if I was renaming him it had to be a name that immediately made me think of my mom. That name is Barnabas. My mother’s favorite show when she was in junior high was the soap opera Dark Shadows (you may know the 2012 movie remake). Her favorite character was named Barnabas. In the late 90s/early 2000s, the series was rerun on the Sci-Fi channel. My mother would record the episodes during the day and once a month have her two girlfriends from junior high over. They would watch the episodes, eat popcorn, talk, and laugh. It became known as “Dark Shadows Night” at our house and my mother always looked forward to it. Barnabas - that would be his new name. Henry (who was only two months old when my mother passed) inherited Barnabas the bear. He has slept with him every night since he was a baby. 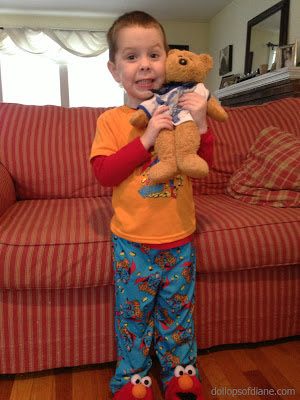 Last week, Henry had pajama day at school and could bring in one special stuffed animal with him. Of course, he chose Barnabas. When we got to school Henry’s teacher asked him if his bear had a name. He said, “His name is Barnabas. He’s extra special because Grammy gave him to me. She’s in Heaven now.” It was at that moment that I knew for sure I had given the bear the right name. Henry and Barnabas ready for Pajama Day!